Ratatouille (film) A rat named Remy dreams of becoming a great chef despite his family’s wishes and the obvious problem of being a rat in a decidedly rodent-phobic profession. When fate places Remy in the city of Paris, he finds himself ideally situated beneath a restaurant made famous by his culinary hero, Auguste Gusteau. 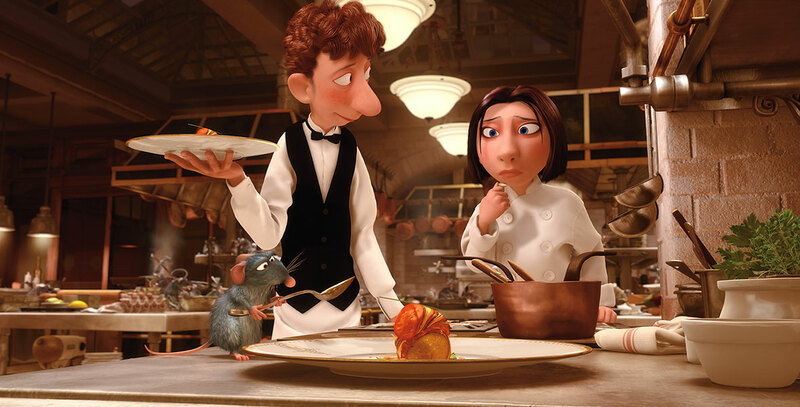 Despite the apparent dangers of being an unwanted visitor in the kitchen at one of Paris’ most exclusive restaurants, Remy forms an unlikely partnership with Linguini, the garbage boy, who inadvertently discovers Remy’s amazing talents. They strike a deal, ultimately setting into motion an exciting chain of extraordinary events that turns the culinary world of Paris upside down. Remy finds himself torn between following his dreams or returning forever to his previous existence as a rat. He learns the truth about friendship, family and having no choice but to be who he really is, a rat who wants to be a chef. Released on June 29, 2007. Directed by Brad Bird. Voices include Brad Garrett (Gusteau), Patton Oswalt (Remy), Lou Romano (Linguini), Brian Dennehy (Django), Peter Sohn (Emile), Peter O’Toole (Anton Ego), Janeane Garofalo (Colette), Ian Holm (Skinner), John Ratzenberger (Mustafa). Director Brad Bird provided the voice of Ambrister Minion. 111 min. Filmed in CinemaScope. The film is the first animated feature from Pixar after Disney’s purchase of the company. Its premise was invented by Jan Pinkava, who received a co-director credit. The film received five Oscar nominations (best animated feature, sound editing, sound mixing, screenplay, original score), winning the award for animated feature. It also won the Golden Tomato Award as the best-reviewed film of the year.